snowdeal.org > ex machina: odin the wanderer - a play. odin the wanderer - a play. 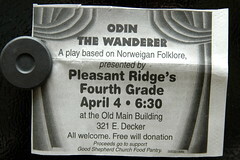 i guess when you're living in the land of odins a play put on by 4th graders about the Original Odin is to be expected. relatedly, our odin goes to school with a girl named after freya. in norwegian folklore, odin and freya would divide the dead lost in battle. strange but true.